CEO Club: The journey into digitalization - WorldCity, Inc.
Jim Mancini (left) from CH Robinson leads the discussion at the latest CEO Club. Click here to view the Facebook photo album from this exclusive event. Transportation, logistics and supply chain service provider companies have often wrestled with how best to transition aspects of the business into digitalization. For example, if you have a contract with a smaller trucking company, it took time to educate many on how digitalization could be an asset and not an inconvenience. In the sector today, it’s often about differentiating your digitized services and apps from those of competitors. 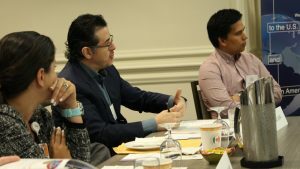 That journey into digitalization was the discussion as the WorldCity CEO Club convened at the Hyatt Coral Gables, this time led by Jim Mancini, general manager at CH Robinson, a leading third-party logistics and supply chain management provider, with approximately $14 billion in annual global revenue and 47,000 unique customers in the United States. For perspective on the challenge CH Robinson has faced in implementing new digital services for customers via contracted providers, realize 99 percent of the 206,000 trucking companies CH Robinson contracts have fewer than 50 trucks in their fleet. These are often small-to-medium-sized shippers who had been truckin’ along the same way for decades. 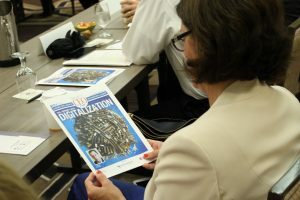 Mancini’s experience in implementing that digitalization generated many questions from the roundtable of CEOs, followed by insights from Mancini and others. Marta Clark, vice president of sales at Wacom Technology for the Latin America and Caribbean region, looks at the program from the latest CEO Club. It’s one thing to offer digital services to customers, but your providers must understand how to use them and why those digital services will help the providers’ businesses. This was the issue presented by Marta Clark, vice president of sales at Wacom Technology for the Latin America and Caribbean region. How do you ensure that smaller providers have the right technology? This was the question posed by Guillermo Campos, director at Berkowitz Pollack Brant Accountants and Advisors. However, if that small outfit uses an intermediary like CH Robinson, it can gain access to a different portfolio of clients and shipments. Therefore, digitalization by CH Robinson is making the company even more attractive to clients/customers and providers. “You can run your business in a different way than if you were independently running it,” said Mancini. 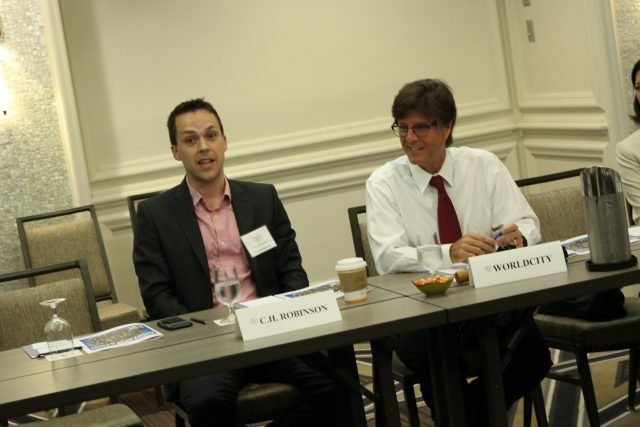 Michael Costello, senior vice president and international general manager at Clorox, wanted to know how CH Robinson is thinking about growth versus cost when investing in automated processes. Mancini said his company had 1.5 million searches in 2016. Those are then followed by a phone call to book. Miami CEO and Chief Growth Officer for Latin America at McCann Worldgroup Carlos Gutierrez (left) asks a question at CEO Club. Carlos Gutierrez, Miami CEO and chief growth officer for Latin America at McCann Worldgroup, wanted to know what CH Robinson was seeing in usage in recent years of the digitalization. “Behind-the-scenes, there’s been a gradual build up to this, but as far as the marketplace, the demand has kind of spiked up for this information pretty quickly,” said Mancini. Mancini said CH Robinson did 98 million status updates on shipments in 2016 and that statistic is already up 40 percent year-to-date in 2017. “The end consumer wants to know where the product is en route,” said Mancini. ECU Worldwide USA Regional CEO John Abisch asked if CH Robinson still decides on pricing with manual processes or has incorporated artificial intelligence. Mancini also said in the past two to three years there’s been a significant jump in the amount of data and guidance in selecting a price. The next CEO Club will take place August 4. On July 28, World City’s Global Connections series continues with a forum on cyber security. On August 18, World City’s Trade Connections series continues with the release of Perishables TradeNumbers.